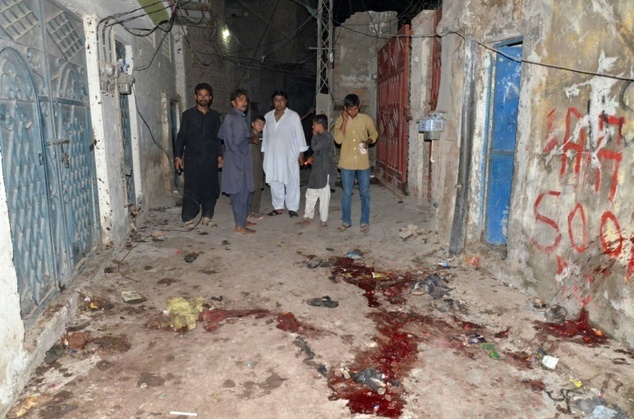 JNN 25 Oct 2015 JACOBABAD: A Suicide bomber targeted a 9th Muharram procession near Shershah Haveli in Jacobabad’s Lashari Mohalla Friday evening, killing at least 20 people and injuring many others, Media reported. Security and rescue teams rushed to the site following the explosion. The dead and the injured were shifted to Civil Hospital Jacobabad, where an emergency has been declared. Rescue and hospital sources told the Media that at least 20 persons were killed in the incident, including four children. Speaking to Our Correspondent over phone from the site of the attack, SSP Jacobabad said more than 15 people were killed in the attack. The police officer explained that the blast took place in a six-feet wide alley in Lashari Mohalla. The director general health services of Sindh, Dr Hassan Murad Shah, said an emergency has been declared in District Hospital Jacobabad. He, however, avoided confirming the number of dead bodies received by the district hospital. The Procession which was hit by the Suicide Bomber was attended by Majority of the Young People under the ages of 15 , as due to this it was not given mere Importance by the administration ,secondly the Interior of Sindh was not been Provided with adequate security by the administration , while it was highlighted by the Shia Dignitaries in the Meetings Prior to Muharram that as per the Prevailing conditions , the terrorists are targeting soft Targets instead of High Value Targets which was quite evident , from Army Public School , Safoora Goth Incident and attacks on Unarmed Traffic Police Constables , but still it was not considered , which resulted in such a Big Casualty . The List of the Martyred shows that the ages of the Majority of Martyred are Below 15 years. The critically injured were transferred By the Pakistan Air Force Plane from Jacobabad to Karachi’s Private Hospital for treatment , as Jacobabad Hospitals were incapable of treating the critically injured persons due to lack of Instruments and experienced Hospital Staff. Security personnel cordoned off the area following the incident, while a search and rescue operation was initiated. Sectarian violence has claimed thousands of lives in the country over the past decade. Yesterday, a suicide attacker blew himself outside an imambargah in Bolan’s Goth Chalghari area, killing at least 10 people and injuring many others. Today’s attack is the second deadliest bombing on a Shia congregation after 61 people were killed and at least another 60 were injured in a bomb explosion in an imambargah in upper Sindh district of Shikarpur on Jan 30, 2015. Law enforcement agencies in Sindh had found a “nexus between sectarian terrorists and anti-state elements”, posing a threat to peace during Muharram. The intelligence agencies were told to keep an eye on the Indian intelligence agency RAW during the month, it emerged. The Sindh government had already imposed a ban on pillion riding in Karachi, Hyderabad, Sukkur and Larkana. Moreover, cell phone services have also been suspended in major cities, including Karachi, as a security measure during the observance of Muharram. The Notables of the Shia Community have asked the Sindh and the Federal Govt to Increase their efforts to curb the menace of terrorism from the Country and Have emphasized that taking an offensive approach against the terrorists Networks will also help the Problems of the common Pakistanis during the commemoration of the Religious & Social Activities , due to which heavy security measure have to be taken by the security agencies , which may be in shape of Banning Pillion ridding , sealing of Place of gathering and routes of Procession , Jamming Mobile Phones and Internet , for which the we have never demanded from the LEAs but as even the LEAs are even helpless as they have no other ways to secure the Huge gatherings and Processions other than the above Mentioned ways , so keeping in consideration whole of the Patriotic Pakistani population cooperate with the LEAs for the Peaceful commemoration of Religious and Social Events . In General Peaceful and Patriotic Pakistani Population totally support and Back up the National Action Plan in which Patriotic Pakistani Forces under the Leadership of Gen Raheel Sharif are on the offensive against the enemies of Pakistan and Islam inside the Countries and even External threats .And the Patriotic Pakistani Population in and out of Country have crossed their fingers and Pray for the Early victory of the National Action Plan , which will lead the Pakistani Nation into a New Era of Success and Victory against the Evil Plans laid by the Saudi Monarchy , Persian Gulf States and specially US and UK , who are the Most beneficent by creating chaos , and anarchy in the country . This entry was posted in Asia Pacific, Jafria, Pakistan News and tagged 2015, Jacobabad, muharram procession, Pakistani, Sindh, suicide bombing. Bookmark the permalink.